Just back from seeing Monsters at FACT in Liverpool followed by an excellent meal at Tapas Tapas. Monsters is a science fiction, road movie, love story, monster invasion film and I can’t think of a single film to really compare it to. Six years after giant aliens landed on Earth the South of the US and the North of Mexico is now effectively a war zone and disaster area where the aliens migrate to each year to breed. The story centres on a photojournalist who has to try and get his paper’s proprietor’s daughter home from Mexico to the USA. There’s two things in the world you never want to let people see how you make ’em: laws and sausages. The reviewers are obsessing about the process of film making process rather than the sausages that have been made. The problem with that is it’s grossly unfair to Monsters. If you don’t know how Monsters was made you’d not be able to tell it was a low budget film with script, direction, cinematography, production design and visual effects Gareth Edwards. You’d also not realise given the number of extras whose performances are entirely naturalistic and believable that it had a cast of just two professional actors. 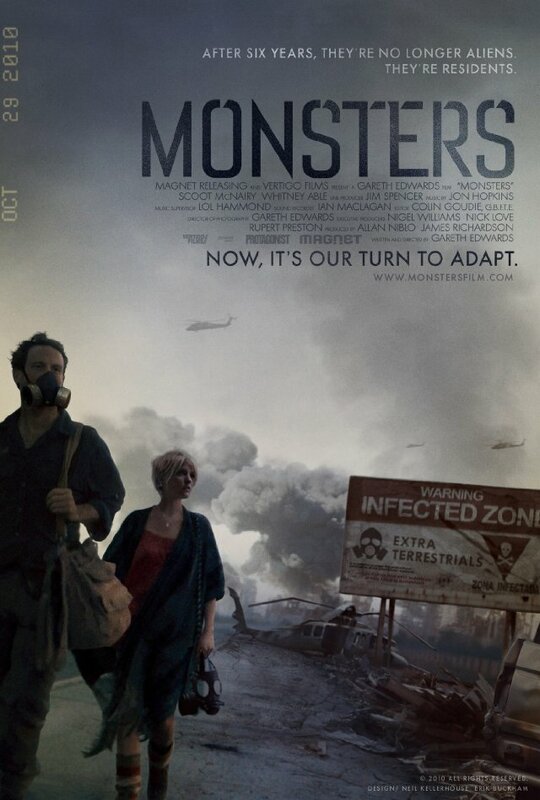 Monsters is every bit as good as big budget productions with ten or twenty times its budget. It is entirely its own film and comparisons to The Blair Witch Project are neither helpful or informative. The story telling is excellent. First of all the pre-credit sequence neatly sets up the world and gives us a glimpse of the alien. Rather than teasing us, Alien style, with it through the film we know what our heroes are facing. Then the story takes us forward six years and along the journey that unfolds shows us the effect of the aliens on Mexico and then the southern USA. Even though in some ways you could argue not a lot happens during the film Monsters builds tension and suspense steadily and effectively right up to the climax. Monsters is also very clever at how it passes on information to the audience about the world now the aliens have arrived. A poorer film might have simply dumped all the information out in one big splurge early on and then focused on the main characters attempt to get home or war with the aliens. Monsters drips out the information a little bit at a time along the way letting us build a picture of the world as we go. Both the leads are highly watchable and believable. These are believable characters who make a down to earth science fiction setting entirely believable – even when it’s at its least believable. The special effects are absolutely excellent and entirely believable. They don’t attempt to do anything that they can’t achieve. Many are very cleverly done so rather than planting a big CG effect in our face they are often slightly out of focus, revealed as a quick glimpse of something or largely hidden by the night. To focus on Edwards’ astonishing work is to ignore the contribution made to the film by the sound and editing teams and the music all of which really help make the film into a rounded production. I would say that after Inception this is the best film I’ve seen in 2010. Highly recommended.